Isle of Wight Scooter Rally – another great weekend! DTC Owners Club display in the IOW scooter custom show. Vespa 50 Special – fully loaded! 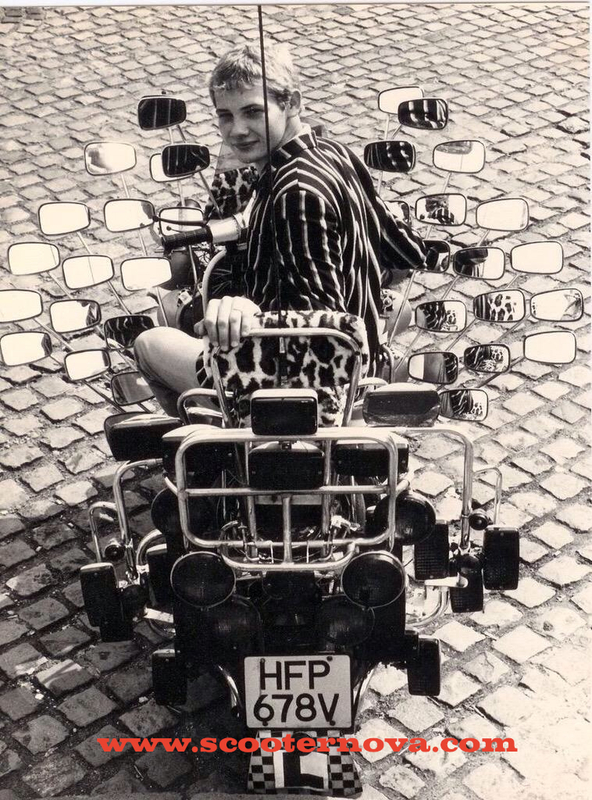 The humble Vespa 50 Special was the first scooter for many turning 16 during the 1980s here in the UK. 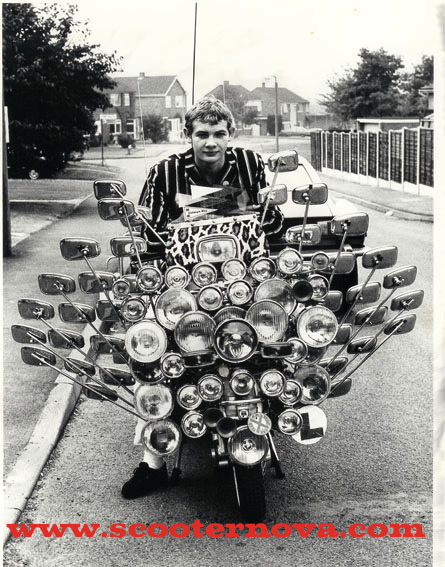 Understandably it became the transport of choice for many a young aspiring Mod, but could you imagine it would cope with this many optional accessories? Truly a peacock amongst scooters! Bryn on his Vespa 50 Special (early 1980s). Legendary scooter rider, Mod, promoter and DJ Tony Class was laid to rest on 27 May after losing his battle with cancer. Tony Class’s funeral, May 2014. A larger than life character, Tony had been part of the scooter scene since the 1970s and was known by many Mods and scooterists nationwide for his work. It was a privilege to have known Tony over the years and attend his funeral which saw his Lambretta GP being ridden behind the horse-drawn hearse, and hundreds of scooterists following causing chaos around the A4 in West London as we all arrived at the church in Chiswick – Tony would have loved that! RIP Mr Page (aka Tony Class) and thank you for all the good times. Lambretta clothing – cheapening the name further? Pinball Wizard – Wanna be one of the faces? The Who‘s Tommy gets the ‘Super DeLuxe’ treatment and is re-released with bonus tracks in November. The launch party takes place at a secret location in London (by which they mean yet to be announced to avoid hundreds of fans turning up unannounced) on 22nd October 2013, and Vespa are offering five lucky people the chance to each win a pair of tickets to this exclusive event. Their blurb reads, “sign up below for the chance to win a pair of tickets to join Pete Townshend & Roger Daltrey at the Tommy Launch Party”, although whether you’ll get the chance to meet two of rock’s great icons is unknown. At the launch you will also apparently get to see the brand new documentary ‘Sensation – The Story of The Who’s Tommy’. For more details on how to enter (and you’d better be quick) go to the Vespa Facebook page, although we had to sign in to Facebook to find all of their posts. But hey, haven’t most people signed up by now?